Kenny and Hollande in Brussels last week. FOLLOWING POSITIVE DEVELOPMENTS in relations with Germany, Enda Kenny is in Paris today to discuss Ireland’s current situation with French president Francois Hollande. The leaders will discuss the role of the European Stability Mechanism in managing Ireland’s crippling bank debt. France’s position on the matter is somewhat less hardline than its neighbours in Berlin and Kenny will hope to see a friend in Hollande. Last night, the Taoiseach issued a joint statement with German chancellor Angela Merkel in which they recognised Ireland as a special case and agreed that the ‘vicious circle’ of banking and sovereign debts should be broken. There will be other matters to discuss today as well given the meeting was scheduled before last week’s EU summit or Sunday’s statement. It is the first bilateral meeting between the pair in one of their capitals since Hollande took office in May this year. It is understood Ireland’s impending presidency of the EU will be tabled. Before the meeting, Kenny will attend a business event hosted by the Embassy for Enterprise Ireland, IDA and Bord Bia clients. His department said it was another opportunity to deliver a strong message that “Ireland is open for business”. Later today, the Taoiseach will visit Bord Bia’s Origin Green initiative at SIAL, one of the world’s largest food fairs. He will meet a number of international and French buyers as 18 Irish companies in attendance try to enhance their reputation as a source of good food and drink products. Email “Enda in Europe: next up, Paris. ”. 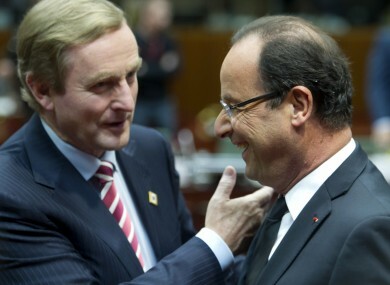 Feedback on “Enda in Europe: next up, Paris. ”.